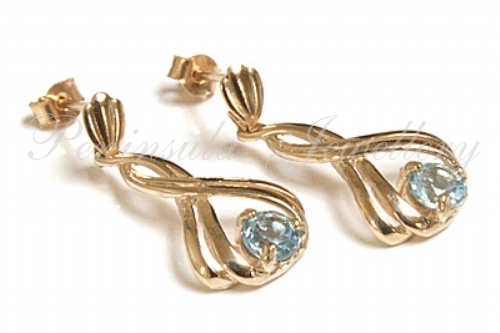 Each earring features a 4mm diameter round cut .18ct Blue Topaz gemstone which has been claw set and nestles safely in a contemporary crossover design. Scalloped fronted posts and scroll fixings in 9 carat gold. Dimensions: 20mm long, 10mm wide at the widest point. Made in England. Presented in a luxury gift box - great gift!